Money Was Once Again A Strong Indicator Of Who Was Going To Win Races For the Michigan House and Senate. But There Were Some Races Where A Candidate With A Financial Disadvantage Won. LANSING (NOV. 20, 2018) — Michigan’s 2016 and 2018 elections were very different. In one, the state backed a Republican candidate for president. In the other, the state backed a Democratic candidate for governor. But there was a similarity. In both elections, candidates for the Michigan Legislature who had a financial advantage won about 90 percent of the time. 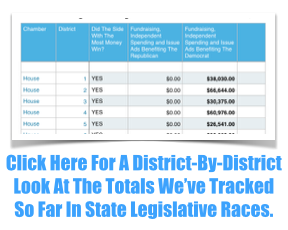 In the 2018 general election, candidates for the Michigan House and Senate with the most financial support won 89.2 percent of the races, according to an analysis of fundraising disclosures, independent spending reports, TV ad disclosures and Kantar Media/CMAG ad-tracking data. While access to money didn’t guarantee success, candidates with a financial advantage won most of the time in 2018. In 2016, only the Michigan House was up for election. In those races, the candidate with the most money won 91.8 percent of the time. The way legislative district lines are drawn and the concentration of like-minded voters in certain areas play a significant role in election outcomes. In some districts that lean heavily toward one party, the winner is effectively decided in the primary election. That allows donors to support the primary winner without fear that person will lose in the general election. According to the Michigan Secretary of State's unofficial results, Democratic candidates won 52.1 percent of the statewide vote for state House seats but won only 47.2 percent of the seats (52 of 110). Democratic candidate won 50.4 percent of the statewide vote for state Senate seats but won only 42.1 percent of the seats (16 of 38). The Michigan Campaign Finance Network’s new analysis includes candidate fundraising totals (the amount of direct and in-kind contributions reported by the campaigns including late contributions reported in the days before Election Day). But it also includes independent spending reported by political action committees (PACs) and super PACs and cable and broadcast TV ads that fell outside of disclosure requirements because they didn’t expressly support or oppose a candidate. The PAC and super PAC spending totals cover through only Oct. 20, 17 days before the election. PACs and super PACs won’t have to report on their spending in the final days before the election until Jan. 31, 2019. The TV “issue” ads included in the analysis are ads that either promote or criticize a candidate without explicitly telling viewers how to vote. In Michigan. The money behind such ads doesn’t have to be reported under state disclosure requirements. MCFN tracks some broadcast ads through data from Kantar Media/CMAG and other broadcast and cable ads through filings with the Federal Communications Commission. 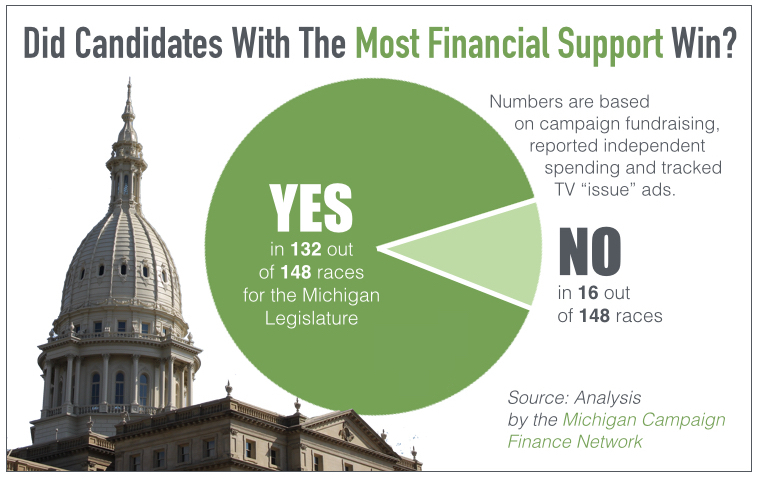 In this analysis, MCFN counted ads or spending that criticized or opposed a certain candidate as financial support for the candidate’s opponent. MCFN can’t determine how much was spent by non-disclosing groups on items like billboards, digital ads or mailers. So it’s possible a candidate benefited from a widespread digital media campaign without it being included in this tally. To see a listing of the numbers MCFN tallied for this analysis, click here. — 59th House District: In the heavily Republican 59th House District, incumbent Rep. Aaron Miller, a Republican from Sturgis, raised only $2,200 for his re-election campaign. He still won with 66 percent of the vote. — 5th Senate District: In the heavily Democratic 5th Senate District, Democrat Betty Jean Alexander of Detroit upset an incumbent senator in the primary. She won the general election with 77 percent of the vote while her campaign raised only $4,600. Her Republican opponent reported raising $29,740. — 7th Senate District: Republicans overwhelmingly outspent Democrats in the 7th District, where Rep. Laura Cox, a Republican from Livonia, lost to Democrat Dayna Polehanki of Livonia. Cox had about $1.72 million on her side, including advertisements sponsored by nonprofits, while Polehanki had about $759,447 on her side. Polehanki got 50.5 percent of the vote. — 110th House District: Republican donors didn’t invest heavily in the Upper Peninsula 110th District but still GOP candidate Gregory Markkanen of Hancock flipped the seat. He raised about $20,305 while Democrat Ken Summers of Baraga had about $187,032 on his side, including ads aired by the Michigan Democratic Party. Markkanen won with 50.8 percent of the vote. — 15th Senate District: No district may have felt the Senate GOP’s financial advantage more than the 15th District. There, groups invested heavily in support of Rep. Jim Runestad, a Republican from White Lake while Democratic groups didn’t spend heavily in favor of Julia Pulver of West Bloomfield. Runestad had about $992,042 on his side while Pulver had about $268,174 on her side. Runestad won with 51.6 percent of the vote while Pulver got 48.3 percent. — 34th Senate District: Democrat Poppy Sias-Hernadez of Muskegon was also at a financial disadvantage in her close race against Republican former Rep. Jon Bumstead of Newaygo. Bumstead had about $1.09 million on his side. Sias-Hernandez had about $601,710 on her side. Bumstead got 50.6 percent of the vote while Sias-Hernandez got 46.3 percent. — 48th House District: The 48th wasn’t one of the most expensive elections statewide. But there, Republican Al Hardwick, of Davison, got 45.1 percent of the vote while raising just $1,700 for his campaign. His Democratic opponent, Sheryl Kennedy of Davison got 54.8 percent with $55,287 on her side. — 61st House District: Rep. Brandt Iden, a Republican from Oshtemo Township, won re-election this fall in a close and expensive race in the 61st District. Iden had about $775,103 on his side, including positive ads from the Citizens for Energizing Michigan's Economy, while Democrat Alberta Griffin of Kalamazoo had about $671,357 on her side. Iden got 51.3 percent of the vote. Griffin got 48.6 percent.